Non-Directional Beacons (NDBs) are today (c.2017) still the most common type of radio beacon found in Australia because of their simplicity and relative cheapness. NDBs are essentially a simple radio transmitter which radiates a signal equally in every direction (hence 'non-directional'). This main signal is modulated with a Morse code identity signal. This allows suitably equipped aircraft to 'home' on the beacon, bringing the aircraft to a position overhead. From there, the aircraft can either track to another beacon, or perform an instrument approach procedure using the NDB for lateral guidance. Perhaps surprisingly, NDBs did not appear in Australia until the Second World War. At that time and into the 1950s they were known as 'Homers'. Aircraft at first used a radio-compass, a receiver with a hand-tuned antenna which enabled the pilot or navigator to measure the relative position of the beacon from the aircraft. From the 1960s the radio-compass gave way to the Automatic Direction Finder (ADF), which performs the antenna-tuning function automatically. The photograph above shows the Wonthaggi, Vic, NDB in the 1960s. 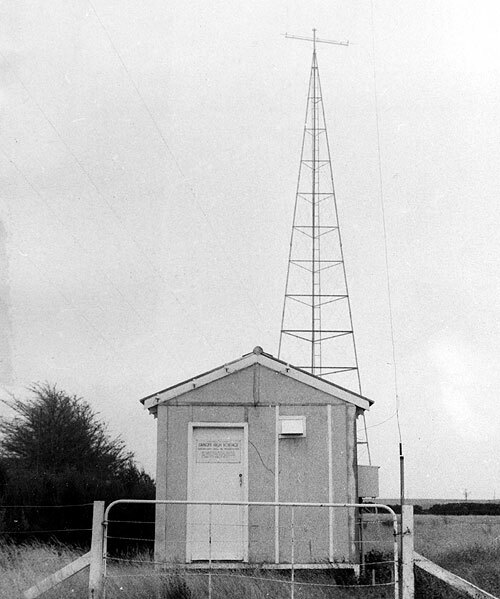 This very typical installation comprises a transmitter hut containing dual transmitters (for redundancy) feeding a vertical aerial, which can just be made out to the right of the hut. The tower in the background is one of two such. The vertical antenna is suspended from horizontal cables strung between the masts. The later photo below shows the Wonthaggi NDB on 27 October 1968. The two towers supporting the central aerial are clearly seen. 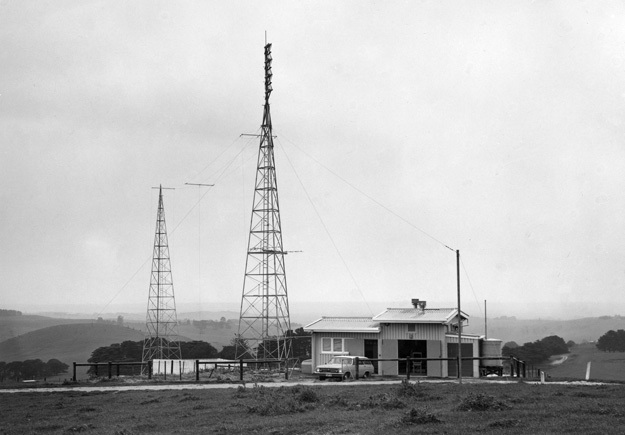 Additionally, atop the nearest tower is an antenna for the Australian DME system. Pairing of an azimuth aid - in this case the NDB - with a DME was usual and enabled pilots to get a continuous position fix.